A study of American women’s narratives of mobility and travel, this book examines how geographic movement opened up other movements or mobilities for antebellum women at a time of great national expansion. Concerned with issues of personal and national identity, the study demonstrates how women not only went out on the open road, but participated in public discussions of nationhood in the texts they wrote. 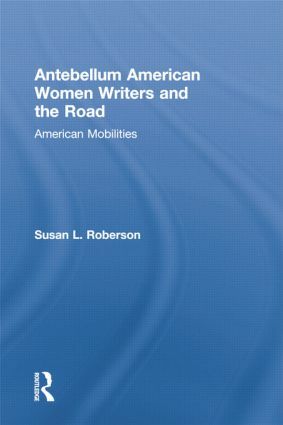 Roberson examines a variety of narratives and subjects, including not only traditional travel narratives of voyages to the West or to foreign locales, but also the ways travel and movement figured in autobiography, spiritual, and political narratives, and domestic novels by women as they constructed their own politics of mobility. These narratives by such women as Margaret Fuller, Susan Warner, and Harriet Beecher Stowe destabilize the male-dominated stories of American travel and nation-building as women claimed the public road as a domain in which they belonged, bringing with them their own ideas about mobility, self, and nation. The many women’s stories of mobility also destabilize a singular view of women’s history and broaden our outlook on geographic movement and its repercussions for other movements. Looking at texts not usually labeled travel writing, like the domestic novel, brings to light social relations enacted on the road and the relation between story, location, and mobility. Susan Roberson is Professor of English at Texas A & M University--Kingsville. She is the author of Emerson in His Sermons: A Man-Made Self (1995) and the editor of Women, America, and Movement: Narratives of Relocation (1998) and of Defining Travel: Diverse Visions (2001).